Guest House Cvrcak is a traditionally built house, completely renovated and modernly equipped. 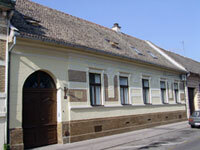 It is located in the very heart of the town, 50 meters from the main street. There are three spacious and contemporary suites and three rooms. Each unit has its own en-suite bathroom (shower, toilet, hair-dryer), cable TV programme and Internet connection. Parking is available in the garden. Breakfast may be served in a very nice setting of the renovated ‘Gradska kafana’ Sombor which is in the main street, about 50 steps from the guest house.